The best turns are earned, not forced. When skiing, my goal is to have my skis deliver turns. I don’t want to have to force them to change direction; rather I want them to carry me along a chosen line of travel during one turn, then flow cleanly and effortlessly into the next turn. The key to achieving this is good timing in terms of movement and effort. Movement means using a dynamic and progressive stance to cause my skis to grip and perform a turn, and effort refers to resisting the increase in pressure that pushes up through my skis and feet during each turn. Notwithstanding early season balance foibles, which (happily) are decreasing in frequency with each day I spend on hill, I focus on feeling the increase in underfoot pressure during each turn. How much pressure occurs with each turn, where in the turn does it start to build, and where does it peak? Within this focus I want that pressure to always increase and decrease smoothly, with no sudden jerks or thumps. Two main contributors help achieve this. First is a keen awareness of my center of balance, or center of pressure, on the soles of my feet during each turn; I aim to feel balanced on a spot midway along the arch side of my outside foot (see the post Early Season Notes - Balance). Second is patience; willing myself to avoid doing anything in order to hurry up the turn. In particular I avoid the temptation to try to ‘make’ pressure early in the turn with some kind of up or down movement. I also avoid trying to turn or steer my skis into the direction that I anticipate they will achieve later in the turn. Instead, I seek to feel a smooth increase in pressure as a result of my skis responding to my centered balance, only. This turn-driven increase and peak in pressure is my primary timing cue. Being in tune with the timing of the pressure increase that accompanies the turn allows me to add movement and effort to amplify, rather than fight, the reaction from my skis. Good timing produces more fun in my skiing with minimal extra effort. I’ll discuss in future posts movement and effort that I regularly use to drive more performance from my skis, and get more enjoyment from the passing terrain. In summary, be patient early in the turn and allow the skis to do what they are designed to do: turn. Don’t try to make pressure, and don’t try to force the skis to change direction. Instead, earn that pressure and your skis’ performance by balancing and allowing the skis to create the turn. 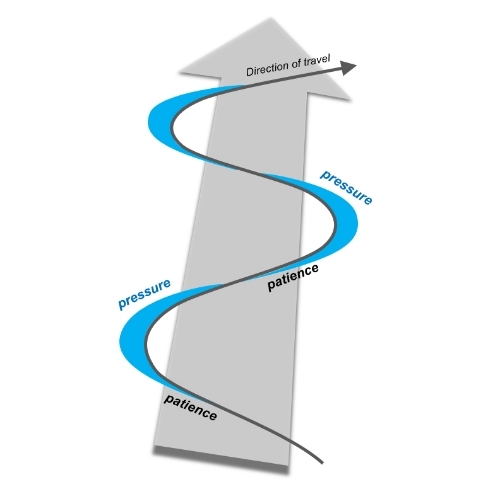 Let the pressure build and time your resistance and tension in order to oppose that increase, smoothly. Doing so develops timing, and produces the best turns. Enjoy! Next: increased grip through movement.